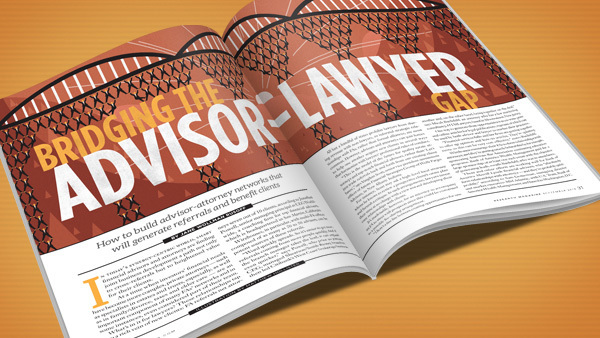 In the September 2015 issue of Research Magazine, contributing editor Jane Wollman Rusoff writes about building advisor-attorney networks that will generate referrals and benefit clients. In being interviewed for her feature, it was interesting to discuss the relationship from the financial services side of the business rather than starting with my usual legal-side perspective. While the cross-referral route is often at the heart of many of these relationships–typically between business lawyers and those advising on the numbers side of a matter–the article points out the need for both to work together. At a time when investors’ financial needs have become more complex, private attorneys — such as specialists in estates and trusts, especially, as well as in family/divorce, taxes and elder care — are an important component of many FAs’ networks and in some instances, even considered part of their team. While I warn about just how close those relationships can get (no fee sharing with non-lawyers in almost every jurisdiction and potential conflicts of interest), there is no question that there is an obvious fit between the two professions. In numerous practices, attorneys I work with on business development strategies will tell me that various finance professionals–from CPAs to planners and investors–are their #1 source of referrals. With that in mind, we often plan social and educational events targeting those relationships. In addition, we often team and partner on marketing efforts aimed directly at the prospective client for both the legal and finance sides. The article also discusses how those in finance seek sponsorships and advertising opportunities with bar associations and legal publications to get their brands in front of the attorney and law firms. I mention the importance of the attorney recognizing the brand of the soliciting financial entity. Just as in legal, having a name that is recognized and trusted is critical to getting in the door. For a lawyer or law firm that invests in marketing to financial services for cross-referrals and joint ventures, this article does a great job showing the marketing strategies from the other side of the street. Launched in 1978, Research Magazine highlights practical advice on how to build a client-centric business, financial tips, as well as business-building topics like personal branding and partnering in teams. Tagged: "Financial Services", "Jane Wollman" and "Research Magazine"